There was a time when the thought of losing Pepe Reina sent fear into the hearts of Reds everywhere. He was an integral part of the Rafa Benitez Liverpool side that went desperately close to the title in 2009-10. When that team started to fall apart in the fag-end of Rafa’s reign there was genuine angst at the likely departure of Pepe. Somehow we held on to him despite losing the majority of the Spanish contingent. Fast-forward to the disastrous tenure of Roy Hodgeson. Here there was uproar when the new manager appeared to question his place in the side. How things have changed. Enter Brendan Rodgers and Reina left the club without so much as a whimper. Back in the summer of 2013 it had all the appearance of an amicable parting of the ways. We were told Brendan had taken his keeper out to dinner. Pepe had delivered the “it’s not you it’s me” speech. The manager understood. Who wouldn’t. How could anyone ignore the anticipated advances from Barcelona? The club prepared for life without Reina and brought in Mignolet. Then from Pepe’s perspective things appear to have gone badly wrong. The much vaunted approach from the Catalans failed to materialise, and the one time ‘numero uno’ found himself playing second fiddle. This is how Rodgers and the club tell the story. To be fair to Reina, he may tell a different one. Only the respective parties know what really happened. It could have been an uncomfortable position for both parties, but for our ex manager . Thankfully Rafa Benitez was waiting in the wings to usher in a fairy tale ending, albeit a temporary one. This may be true, or even understandable but it was massively tactless. There’s no doubt it irked Brendan and he even took a thinly veiled swipe at his keeper, referring to the comment as Reina’s final goodbye note. Now we arrive at the summer transfer window and things appear to have turned full circle. Napoli are now baulking at Liverpool’s asking price to make the deal permanent. Rafa has now publicly stated he doesn’t even want a keeper. For their part the Reds do. Rodgers thinks Mignolet needs some meaningful competition. 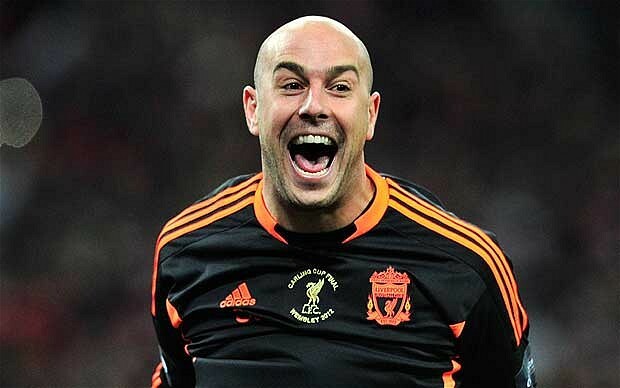 In my view bringing Reina back to the club would be a no-brainer. For a few years he was one of the best keepers in the Premier League, winning golden glove awards for fun in the process. How we could have done with his clean sheet records last season. Admittedly he was behind one of the most organised defences in Europe for most of that time. Nevertheless there is no doubt he is a top quality goalkeeper. He would also provide excellent competition to our Belgian Keeper. Some would argue he’s a better choice. So what’s standing in the way of a glorious return to the club? In my view the obstacles are not based on purely football reasons, at least not as far as the club is concerned. Neither is it true that Brendan is allowing his ego to prevent Reina from coming back to Anfield. Rodgers has shown he can handle his own ego and those of the big stars with distinction. Only a handful of managers could have turned the Suarez situation around last summer. Yes, Luis deserves some credit for knuckling down after his very public spat, but It’s Rodgers who comes out of that with the most credit for me. What is it then? Why wouldn’t we just welcome Pepe back with open arms? For the Spaniard it is all painfully simple. A player of his quality wants and deserves to be first choice. Would he get that at Anfield? Whether we like it or not that’s not likely. However, even this isn’t a deal breaker in my opinion. Liverpool will play many games next year. Reina would get many opportunities. He would be a far mor reliable deputy than the loyal but inferior Brad Jones. The real reason is depressingly more pragmatic. Sadly for me it is highly likely to be the most immovable of obstacles too. Reports vary as to his actual wage, but Reina was one of the highest earners at the club prior to his departure. The new reality of Financial Fair Play (FFP) means that we are very unlikely to see players earning such salaries sitting on the bench for Liverpool next season. Other clubs may live with that. Chelsea and City do now. Liverpool, strict adherents to FFP surely won’t. It’s because of all of this that I can see only one outcome. Arsenal have emerged as a potential way out for both sides, but the latest rumours linking him with the Gunners sound dubious to me. In any case do we really want to sell him to a direct rival for top four? Benitez’ recent statement that he doesn’t want or need Reina brings back memories of the transfer games he played at Liverpool. Of course this could be just the opening salvo in negotiations that will ultimately see the Spaniard join them on a permanent basis. However, if Rafa is serious, Liverpool could be forced to look at another loan deal to free up his wages, or consider reducing their valuation of the player. If these are the options on the table, would a return for Reina really be all that bad?